In doing research about In-N-Out's secret, not-so-secret menu I discovered that there are a TON of other fast food places that have secret menus and I had no clue! These are including, but not limited to: Arby's, Burger King, Chick-Fil-A, Chipotle, Dairy Queen, Five Guys, In-N-Out, Jack in the Box, Jamba Juice, KFC, McDonalds, Panera Bread, Potbelly's, Shake Shack, Sonic, Subway, Taco Bell, Wendy's, and Whataburger. Yeah, like I said, that is a ton of restaurants, right? I myself have partaken of the goodness many times of the In-N-Out secret menu with the animal style burger and actually, just tonight we ordered an AMAZING chicken cordon bleu sandwich from the Potbelly's secret menu. It definitely makes you feel like you're part of some awesome, secret club that hardly anyone is a member of. There are tons of items for all of these restaurants, so I chose some of the ones that sounded the most interesting, or yummiest to me, so I hope you find these interesting as well. You can simply Google secret menus to whatever restaurant you are interested in and you will find many hidden gems :) Welcome to the club! 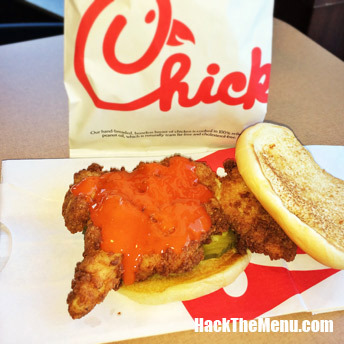 o This sandwich combines the spicy chicken sandwich with a red fire spiced sauce reminiscent of buffalo chicken wing sauce. It's actually like a giant boneless Buffalo "wing" on a bun. The patty actually remains nice and crunchy like the original but the Buffalo sauce adds a deceptively lasting heat to the sandwich. The sandwich actually didn't seem that spicy initially, but once it hits you're left with a slow burn! So, if the spicy chicken sandwich isn't hot enough for you, just ask for the "Buffalo Chicken Sandwich" next time you visit Chick-fil-A. 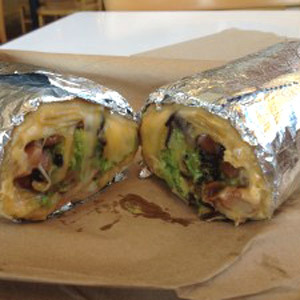 The Burritodilla is a smaller, more diet friendly alteration of the Chipotle Quesarito that allows the consumer to eat without the mess of a behemoth burrito. The secret to the Burritodilla is that it's essentially a Chipotle Quesadilla (also on the secret menu), except only half the fillings of a regular burrito are sandwiched between heaping handfuls of cheese. This glorious mash-up of Chipotle cuisine is then grilled to a perfect crunch. It's an amazing hybrid between a stuffed, flavorful burrito and a straightforward quesadilla. 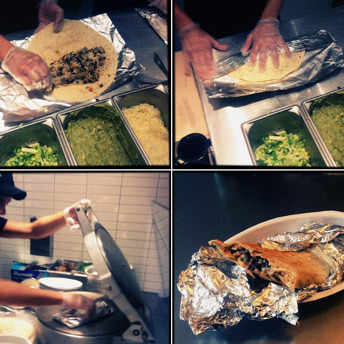 The Chipotle Quesarito burrito is the Holy Grail of theChipotle Secret Menu. it is a burrito in which the "shell" of the burrito is actually a Cheese Quesadilla. That's right, instead of using a plain flour tortilla like the unfortunate soul next to you, the Chipotle servers will start your Quesarito off with a quesadilla they make from sandwiching a heaping amount of cheese between two tortilla shells and heating it in the warmer while you wait. Once you have the quesadilla, the process is back to normal, just tell the server what items and meat you want inside your Quesarito burrito and they will wrap it up and check you out. Chicken Tenders form the solid base of this mountain which is then topped with Roast Turkey, Ham, and then Swiss Cheese. 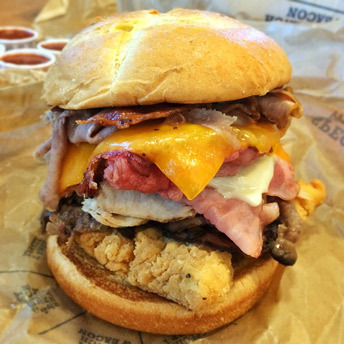 But it doesn't end there, the rest of the sandwich is composed of Brisket, Corned Beef, Angus Steak, Cheddar Cheese, and finished off with their deliciously crispy Bacon. An Arbys Double Stacked Reuben comes loaded with double the amount of corned beef that is used in their regular reubens. The Lemon Dream Machine has a mix of both lemon and lime flavor in a frozen yogurt and soy milk base. Yummo! This extremely popular smoothie is the perfect combination of flavors that will make customers believe they are tasting an authentic Peanut Butter & Jelly union. 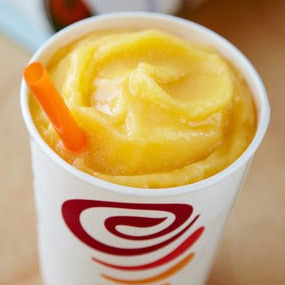 Jamba Juice uses a mixture of Strawberries and Blueberries to create the flavors of sweet and fruity jelly, while adding Soy Milk and Frozen Yogurt to create the smooth and creamy taste of peanut butter.